There are so many reasons for a person to get a tattoo, from showing solidarity with an ill family member to commemorate the death of a loved one, to immortalising a specific date or event in your life. The reasons for tattoo are as varied as the tattoos themselves. If boiled down to its core however, there is typically one constant behind the reason for tattooing your flesh and that is because the tattoo you are receiving means something to you. A tattoo is and forever will be the personalising of a particular event, place, ideal, etc. The key word here is “personal” because that is what tattoo always is. I think we can all agree on that, right? That personal aspect of tattoo is exactly what causes me to voice my disgust with people who feel it’s necessary or cute or justified to get their pet tattooed or pierced. It might sound like some sort of obscure incident, but lawmakers in New York state passed a law this past week that makes it illegal to tattoo or pierce your pet. The fact that the need for this law has come to the attention of the state of New York indicates that tattooing pets isn’t as obscure or rare as we might think it is. As I said, tattoo is a personal act, as is piercing. Taking on body art is a decision that a person makes on their own and only when they have reached the legal age to do so. No sane person would take a child to a tattoo studio without the child’s consent and have them tattooed or pierced. The same goes for animals. An animal cannot give its consent to being tattooed or pierced and furthermore, it is not being tattooed or pierced with something it has selected through its own free will. 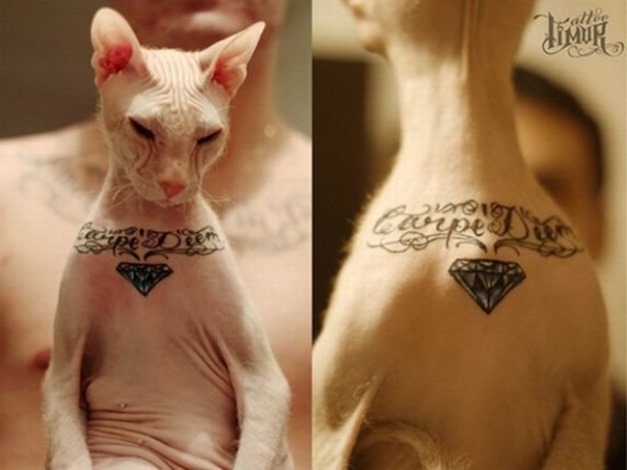 If you get your pet tattooed or pierced, make no mistake about it: you’re a first class scumbag. This isn’t a difficult concept to understand: respect the lives of others, whether they be a kitten or a small child. Everyone has the right to their own life. Obviously this practice of tattooing animals has something to do with filling some disgusting niche market out there for people who think it’s cool or cute or whatever to get a pet that has a little something different about it. If you want a little something different about your pet, maybe your own life needs to be more exciting. Animals are not blank canvases for you to alter as you see fit.